My family and friends tell me I’ll be fine and that I’ll pass the exam with flying colors, but I continue to doubt my own ability. I study for 8-10 hours a day and tell myself “I can do it.” I’ve paid the $500 fee and been approved to sit for the exam, so I’ve committed to the fact that “I will do it.” Yet, there are still many times when I find myself feeling like “I can’t do it.” It’s as if I’m straddled between those three different steps, not fully committed to one or the other. It’s frustrating to be sure, but I think maybe it’s also healthy. In contrast, while I’m straddling the 3 steps, I genuinely feel the fragile nature of the staircase. I’m acutely aware of the fact that I could easily fall backwards. 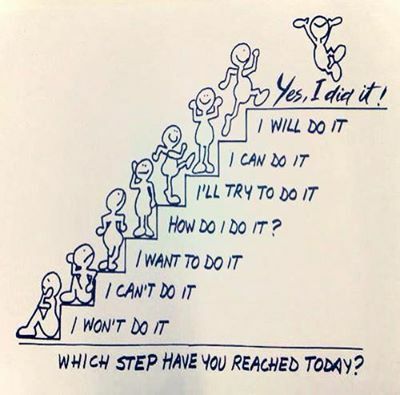 Rather than comfortably resting on the “I can do it” step, I realize I have to work hard to push to that final rewarding step. This is what drives me.